Today’s build 8788 of the Wrath beta reveals where at least some of those patterns are going to come from: they’ll be purchasable with Dalaran Jewelcrafter’s Tokens. According to the latest BlizzCast, these tokens will come from completing profession-based daily quests. One can probably assume that there will be tokens for each type of profession quest, which will be used to purchase patterns for that profession. 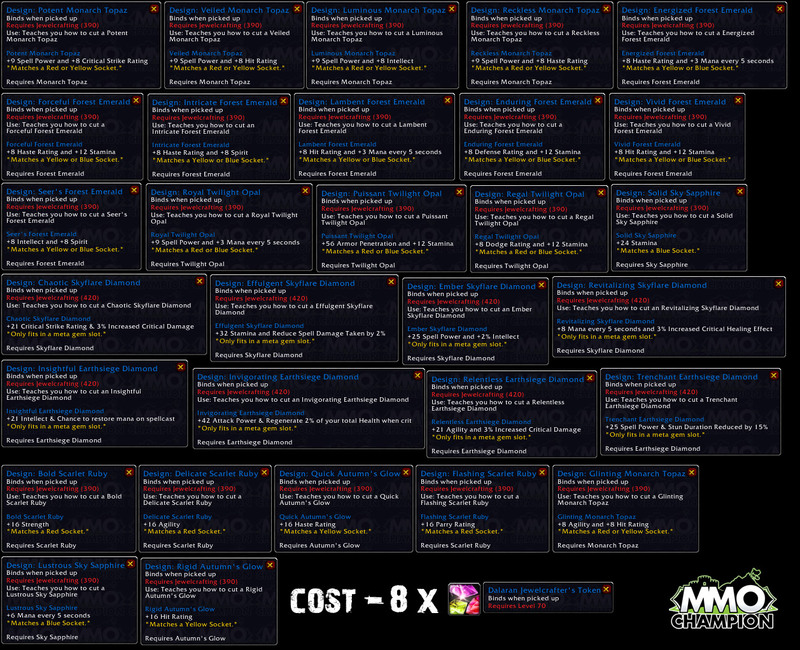 MMO-Champion has provided a screenshot of thirty new rare-quality gem cuts, each of which cost 8 jewelcrafter tokens. You can see from the screenshot that there are some “missing” cuts in there that hadn’t previously been available in uncommon form, such as the much-loved Reckless (Spellpower/Haste) orange cut. To be fair, it’s a hell of a lot better than the TBC system, where all the initially-available rare cuts were BoE world drops – now that was expensive. Eighteen new epic gem cuts have also been implemented, as seen in this screenshot from MMO-Champion. What’s really interesting here is that all these epic cuts only use one type of raw gem – a “Dragon’s Eye”. 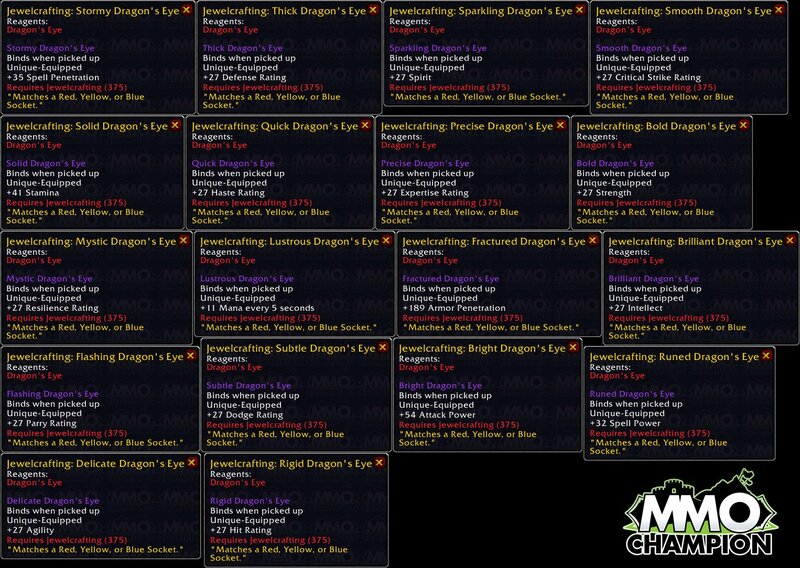 The cuts fit the usual naming conventions – a “Bold Dragon’s Eye” adds +27 Strength; a “Lustrous Dragon’s Eye” adds +11 mp5 – but all of them fit any color gem socket. On the one hand, that will make it much easier to gem one’s gear while retaining socket bonuses; on the other hand, it may make meta gem activation more fiddly. Also, these epic gems only include cuts that are normally associated with red, yellow and blue gems. The “hybrid” multi-stat cuts associated with orange, green and purple gems haven’t been implemented in epic form yet – and given the multi-color nature of the Dragon’s Eye epic gems, they may not be. Edit: Muiran pointed out via the comments that these gems are BoP, which presumably means they’re intended to be the Northrend equivalent of the existing epic JC-only cuts. The Jewelcrafting quests are up on the beta server now, although of course they’re subject to change during beta testing. The quests I looked at are offered by Timothy Jones, the Jewelcrafting trainer in Dalaran. He offers six quest choices, but you can only take one at a time (presumably, one a day). Each daily quest asks you to take three items back to Timothy – a quest drop from a Northrend mob and two uncommon-quality cut gems of different colors. For example, the “Shipment: Bright Armor Relic” quest asks for an Elemental Armor Scrap, a Bright Bloodstone and a Potent Huge Citrine. (I haven’t yet researched the relative availability of the different quest drops, as these quests are so new.) Each quest rewards 7.4g (at level 70) and a single Dalaran Jewelcrafter’s Token. Assuming you can only complete one of these a day, and there are no other sources of the Jewelcrafter tokens, it’ll take 8 days to get each new pattern – for the complete set of thirty patterns that’s about eight months of constant dailies. That seems… excessive, but who knows? There may be other sources of the tokens, or the cost may be adjusted – it’s still in beta, after all. Once I’m confident that the majority of Jewelcrafting patterns have been implemented, I’ll release a reference sheet for Wrath cuts along the same lines as the existing (and quite popular) Jewelcrafting Quick Reference Sheet. It’s in progress now, but there are too many gaps to release it as-is. It looks like the Dragon’s Eye cuts are JC-only, since the cut gems are BoP. So depending on your class and spec, you may be able to use a variety of cut Dragon’s Eyes in whatever sockets you like. As far as meta gems, right now the new meta gems don’t have any particular gem requirements, other than they only go in a meta gem socket. Whether this is permanent or just NYI remains to be seen. What I’m worried about is how we’re going to be able to level to the current BC Jewelcrafting cap. At the moment, my JC has stalled because I can’t afford to blow 600g on a single pattern. I have this horrible sinking feeling that when WotLK comes out, Outland will be deserted save for the legions of Death Knights, and the prices of these levelling recipies will skyrocket. I really hope Blizzard just adds these BoE world drop recipies to a trainer somewhere, or I might just scrap jewelcrafting altogether. Muiran – I feel stoopid, not noticing they’re BoP! I’ll add a note to the post now. Itsnoteasy – I imagine Blizzard will shift things around to make it a bit more viable to level; also note that a few recipes are now available via faction purchases – the epic gems from SSO, various of the rare ‘animal’ trinkets from Outland faction quartermasters, and four rare gem cuts from Exalted SSO & Consortium. I suspect that some of the reason for making each of those recipes take 8 real-life days to get is that it will limit the “I blew shitloads of gold on the rare cuts and now I can make a killing before everyone else gets the recipes” effect, as well as the “There’s this one character in my guild who does all the jewelcrafting for us, so I don’t need to buy cut gems from the AH” effect. In that webcast/interview he was talking about how discovery was meant to make it so different people had different recipes and people were able to make a bit of money in their own niche, but that didn’t work out well. This looks to be a friendlier way to do it. I think the point is that you aren’t _meant_ to be able to get them all, especially anytime soon. Very disappointing, I think. That just creates inconvenience, not a “niche”. From the patterns I have seen on the WotLK info site, there will be patterns that start below current max level. I have seen a few vendor patterns with I assume easy to get base mats starting at a skill level of 360.